Fine Food Specialist is a haven for food lovers seeking outstanding ingredients from all over the world. 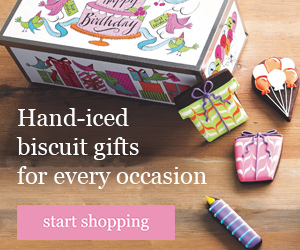 The Craft Company is the UK's leading online cake and cupcake supplies company. Selling ingredients, boards, boxes, bakeware, sprinkles, glitters, decorations, ribbon, moulds, jam making and chocolate making. Milk & More is the online access to your local milkman! Get milk and more delivered to your doorstep. You can place your order online, right up until 9pm the night before delivery! You can choose from over 250 daily essentials from breakfast goodies and lunchbox staples through to cleaning products and pet food. You can also choose from more than 36 different types of milk including organic, 1% fat, flavoured and speciality milks. Once signed up, there is no minimum spend. In recent years it's become easier to find gluten free food. All too often though, "gluten free" also means "taste free" and even "nutrition free". But there are great gluten free products ... if you can find them. We discover and deliver the world's best gluten free products. We bring pasta from Italy, liquorice from Australia, bread from the USA, biscuits from Ireland, seaweed snacks from Korea and much more. MANY OF OUR PRODUCTS ARE EXCLUSIVE TO US IN EUROPE AND CANNOT BE FOUND IN SUPERMARKETS. We taste and test everything we come across, so customers don't have to. We write honest and independent reviews. No more trial and error for customers. Only great tasting gluten free products that everyone can enjoy.